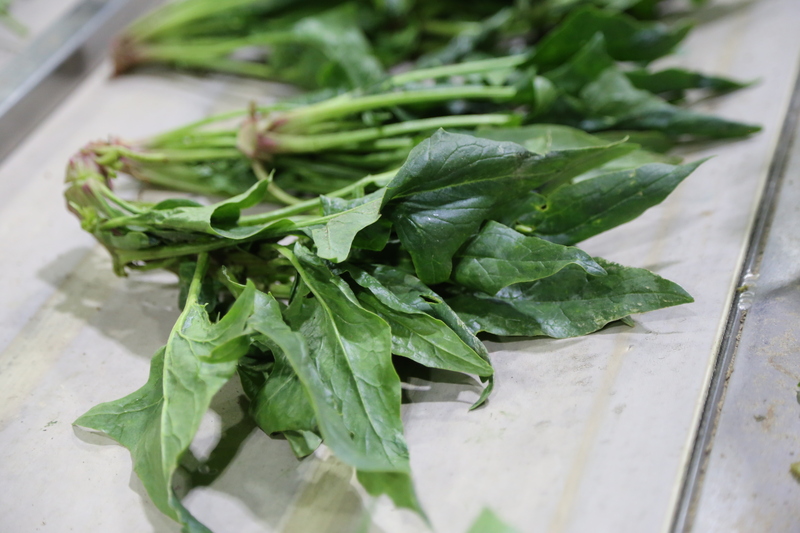 The first spinach of the season spends the whole winter in the fields. It was planted late last fall and grew to be just over an inch tall before the frost made it dormant. It lay waiting under the snow (what little we got) until the spring sunshine warmed it and it began to grow again. Some of the leaves that had grown last fall are yellowed and pale, but the new growth is a deep green that just begs to be tasted! Over-wintering used to be something that was only possible further south or in European climates that experience milder winters than we typically have here. When it happened somewhat by accident in our fields one year, we started trials of the technique enthusiastically as it helps us meet our mission to have local produce whenever possible. In the last few years we have been able to plant crops late in fall and harvest in early spring every year. When the soil is warm enough in spring, we start to plant the next spinach and continue to seed a new crop about every two weeks through the summer and into the fall. 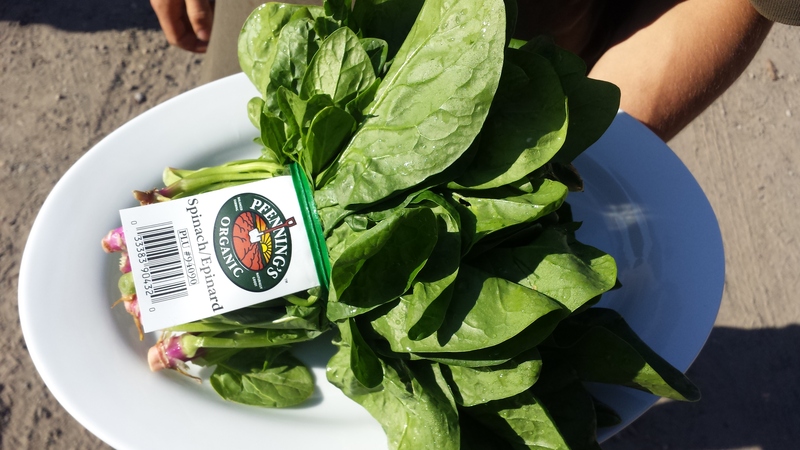 We are harvesting the spring planted spinach now. It is a taste of a promising season to come! 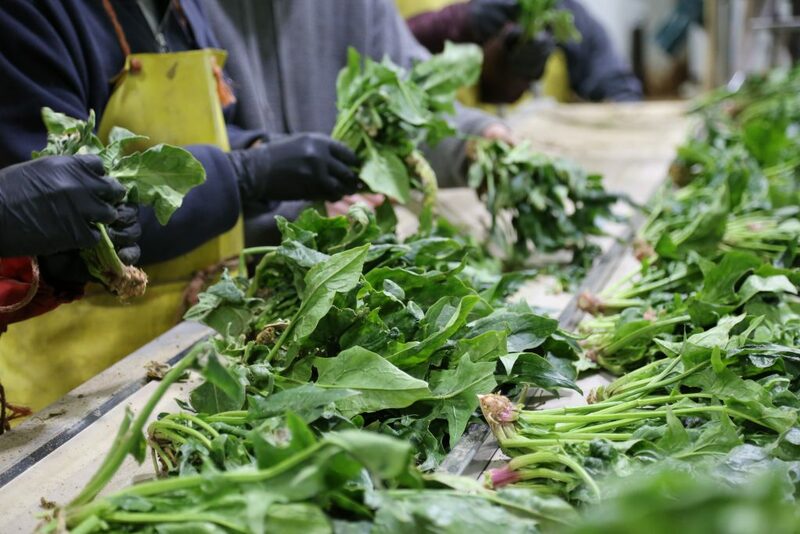 Our packing team at work trimming off brown leaves and assembling the spinach into generously fat bundles for you! Having spent the winter being snowed on and then rained on in the spring you might think this would be the cleanest plant to come off the field. Not so. The rain splashes up a lot of soil into the leaves so it needs extra washing. What does this amazingly hardy vegetable taste like? The frost makes it sweeter than usual, making it especially good for salads, or juice, or a spinach dip… ok, it is just delicious! The rich, dark green leaves are beautiful and crisp, and some of them are tightly curled and crinkled from the changes in temperature. Spring and summer plantings have more uniform leaves than the over-wintered plants. The first plantings of spring-planted spinach have not had it easy this year! First, the cool weather through May, then a heat wave hit. With the big changes in temperature, one planting decided that it must be time to flower and went from baby size to flowering in a matter of days. Don’t worry: the next planting looks fantastic and will be ready for your plate before you read this blog! 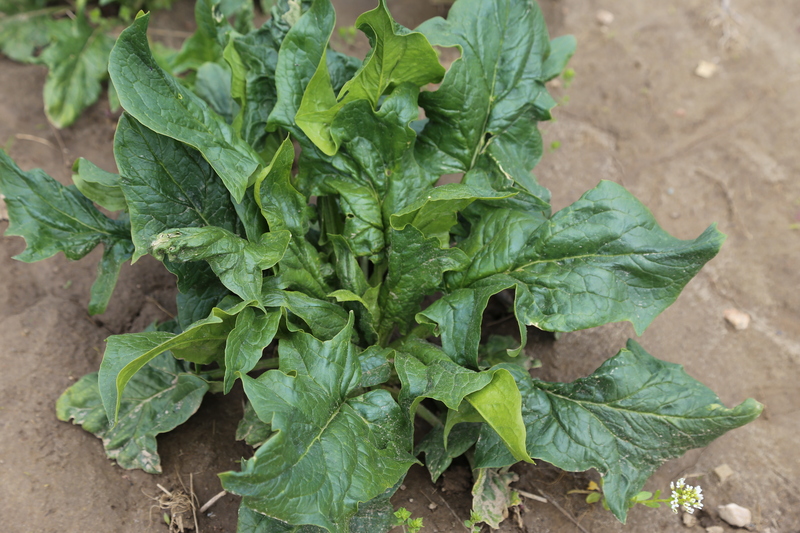 This week, for a glimpse into the spinach harvest and farm life as seen by one of our summer students, we are sharing Guri Dhillon’s blog with you. He is working on our farm for the co-op part of his Sustainable Agriculture program at Sir Sanford Fleming College. This is the fifth year that we have had summer co-op students from this program.